Why do most new businesses fail, yet a few entrepreneurs have a habit of winning over and over again? The shocking discovery of years of research and trial is that most startups fail by doing the “right things,” but doing them out of order. In other words, human nature combined with our entrepreneurial drive puts us on autopilot to become part of the 70% to 90% of ventures that fail. From Thomas Edison to Steve Jobs, the Nail It Then Scale It method is based on pattern recognition of the timeless principles and key practices used by successful entrepreneurs to repeatedly innovate. These processes and principles have now been distilled into a handbook to guide entrepreneurs and innovative product managers to victory. Stop following conventional wisdom and join the few entrepreneurs that can consistently take their innovative idea all the way to a successful company launch. 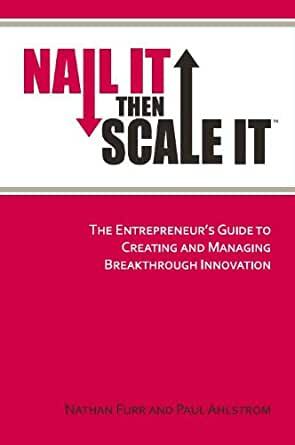 "Nail It then Scale It does a great job synthesizing the current thinking around disruptive innovations and entrepreneurship and channeling it into an actionable set of frameworks and processes. Both the recommended actions and there sequence seem very practical to me, and I think this should serve as a great tool for start-up teams. Congratulations." "The principles in Nail It Then Scale It provide a proven formula for entrepreneurial success. The truth is that most successful businesses are not built on one extraordinary idea. Instead, they are built on many ideas, followed by tons of hard work, research, iteration and listening to customers who articulate their pains and problems. The NISI checklist in the appendix is pure gold for entrepreneurs!" "How rare to find practical, hands on advice from someone who has actually done it. I read it with a perspective of "take home value" and I found ideas that I could apply in every chapter. In my world time is the most precious commodity so it is the ultimate compliment to say that your book was well worth the time I spent reading it. Wish I had read this 30 years ago." The goal of any entrepreneur is to build something customers want, for a problem they're willing to pay for. Yet 90% of businesses fail because they can't get anyone to buy. Why is this the case? Y Combinator founder Paul Graham promotes the motto "Make something people want." Paradoxically, research shows that the natural tendencies of entrepreneurs jeopardize that mission, every step of the way. For example, entrepreneurs easily fall into the habit of following their own beliefs rather than facing up to the realities of the market before it's too late. Ultimately, our greatest enemy is ourselves--investing our time and money into things that won't work, at the cost of not discovering and pursuing the things that will work. NISI outlines a process that emphasizes having a scientific, unemotional mindset and maximizes time to failure, thereby minimizing the potential sunk cost of trying to realize a true business opportunity. NISI also warns us of the natural psychological traps of entrepreneurs and how to avoid them. At its core, the NISI about avoiding dangerous path of "I've got a great idea", and instead taking the road of "customer data indicates that this is true". The NISI process is straightforward and methodical: start with hypothesis about the customer pain, then test it. Once you've identified and validated the customer pain, hypothesize the minimum feature-set necessary to drive a customer purchase. From there, build a series of gradually more advanced prototypes, while discussing and validating with customers each step of the way. Eventually, you build a usable solution and sign up pilot customers, who help you refine your product and develop a go-to-market strategy. This process can be applied to startups, new ventures within, and to turn around lagging companies. But while this process sounds simple--even conventional--the true challenge is avoiding common entrepreneurial pitfalls and having the discipline to adhere to this process in full. My main takeaways? Talk to customers starting on day one, and don't stop. Be a scientist, not a hero. 1) I thought that the third phase, "Nail the Go-to-Market Strategy" was presented weakly compared to the earlier phases. I give the authors credit for trying to condense positioning, marketing, and sales into a relatively small number of pages. But I felt that the sections on understanding the customer buying process and market communication and distribution infrastructure were not as practical as I would have hoped. 2) The process, or at least the explanations and examples (eg. cold email scripts), is tilted toward B2B. I've started a B2B business previously, and from that perspective the content seemed spot-on. But as someone working on a B2C business now, I felt a little bit short-changed. 5.0 out of 5 starsChanges the way you think in important ways! Absolutely loved this book! Anyone involved in any kind of organization of any size will benefit greatly from reading this book. It cuts through all of the organizational fluff that we are all used to hearing about and centers you on what's really important. For me personally, I applied these principles to the way I lead my faith group at school and it helped me break out of the habit of day-to-day administrative habits and helped me focus on what's really important and what we want to accomplish as an organization. This book has inspired me to viciously tackle the central problem and relentlessly chase the central solution. 5.0 out of 5 starsYou're probably wrong. Read this book before you start. Lean Startup in more Americany terms. Not much to say, except read it if you have ANY desire to start a business from the ground up. TL;DR: Your middle-of-the-night ideas are probably stupid. You're probably wrong. Take the minimum time to get a prototype in the face of your potential customers, iterate on their feedback, and DO NOT INVEST significant money and time until you have tried to prove your idea wrong from many angles with customer feedback. Indeed, if you haven't disproven any part of your business idea, you haven't tried hard enough -- no successful businessman or businesswoman just *knows* what people want. The first half of this book was a great read. It's a pretty common theme nowadays to hear about validating an idea before and while you build it, but this book adds some good detail and really solidifies the concepts. Maybe it's because I don't have a ton of experience in business and market research, but the second half of the book pretty much went over my head. There wasn't much of an explanation of the different terms that he used, and I had a difficult time thinking about the concepts in real-world situations.